Pre-order the Disney classic at Amazon and receive an instant $8 off coupon! 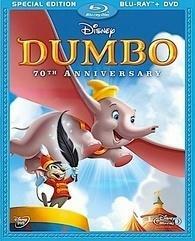 Amazon is currently offering 'Dumbo' for $27.99 (30% off suggested list price), but they also have a coupon offer for an additional $8.00 off the price -- making it only $19.99! Plus, if the price drops further between now and the September 20 release date, Amazon's price guarantee will kick in for additional savings so there's nothing to lose! Click here to access the page where you can pre-order your copy (or here if you prefer DVD packaging) and clip the coupon right now!